Are these the rules of the certifications or the artificially created Compliance, which increasingly burden entrepreneurial action nowadays? Or are these potentially the employees on all levels that prove patience, do not offend and realize slowly the Peter’s principle? Stimuli for new approaches should be delivered by science, consultants or best-practice. However, they introduce again and again the same for all. State-of-the-art software generates ever more similar cars for automakers. The same target groups are provided by a few, specialized agencies. Ready-made ERP systems lead to more and more similar procedures. Despite the continuous outcomes, certified project managers are still preferred instead of capable leader personalities. Entrepreneurs reuse the business models that are already established in the market, in order to make nothing wrong. The outsourcing caravan follows the swarm – first China, then India, now Africa. Is this not entrepreneurship in lockstep? Today, it would be difficult for Henry Ford to realize his ideas – too much national regimentation, exuberant bureaucracy, actively obstructing interest groups. The Ford Model T, that was available in any color, as long as it was black, would not receive MOT approval. Cartel authorities would nip any bundling of enterprises in the bud. Innovative ideas must be promptly published in the interest of the shareholder protection. Today’s managers are not able to act entrepreneurially, even if they wanted. After years of standardization, the responsible people know behind which arguments to hide. An obviously pragmatic approach is the focus on the core business. The actual tasks that contribute at most to the corporate success or that the customers associate especially with the enterprise constitute the relevant business. This you can see at the production depth. While Ford reached in the beginning nearly 100% creation of value, the production depth in the automotive area sank until today on average to 20%. Thus, the cars are actually developed and manufactured by the suppliers. With this division of labor, the enterprises gave up their originally comprehensive power. Eventually this affects even the innovative ness that is handed over to the suppliers. That way the shoemaker degenerates to a 20-percent nerd, who only sews the shoes, pack them into a box and place them on the market. On a long-term basis other specialists can even do it better. With the last 20% then the enterprise will also dissolve. The new swarm approaches suggest that you can use the knowledge of others without expenditure. Since many enterprises have already sold their silver in the interest of the shareholder values, shifted jobs abroad by outsourcing and have reduced over the years personnel, the knowledge of the remaining employees is the last asset that can be exploited. With the strategy of swarm intelligence one or the other got the idea to open these economical resources. Customers and employees are invited to express their ideas. This is not about growing knowledge, but siphoning off the existing ideas. What is forgotten here is the fact that swarm intelligence creates highly redundant knowledge. It still must be separated entrepreneurially the useful from the noise. Goethe already wrote: “And here, poor fool, I stand once more, No wiser than I was before.” Additionally this this source of knowledge offers also the other companies similar insights. You will not be ahead of the pack, but you will fall in the same black hole of disadvantages. And what is above all difficult: The competitors remain abreast, since they foster each other. The advocates of standard solutions expect savings by distributing the costs on multiple shoulders. At the end of the last millennium the tsunami of today’s standard software built up. In the companies a clew of self-developments had been formed over time that could be maintained only with difficulties by own means. In the meantime the clew is back again, only that it is now knotted by the software makers. And again egalitarian approaches prevent the advantage that you could obtain by your own engagement. If you look at simple applications, like HR-systems, the solutions only differ in the logo. After the initial upside of the ERP system is already past, we notice meanwhile more and more, in what expensive hole we landed. The software provider determines, when, which release to be used – with all consequences for the internal interfaces. The Gordian knot becomes even tighter. Who can now afford the development or introduction of another solution? And what is especially harmful – nobody is ready for entrepreneurial improvisations. The manager is safe, since the decision for the standard solution is the right decision, because everybody uses it. The whole thing reminds of socialist countries with their business thinking – always the same, no risk, not being noticeable, not harming the community, sticking to the rules etc. You can see this in nowadays Compliance. You always had to adhere to the laws, but however now many practice anticipatory obedience. After all the consequences of courageous acting are no longer clear. It is the same as with the bonsai method that was published in the 90s – nip any sprouting engagement in the bud. 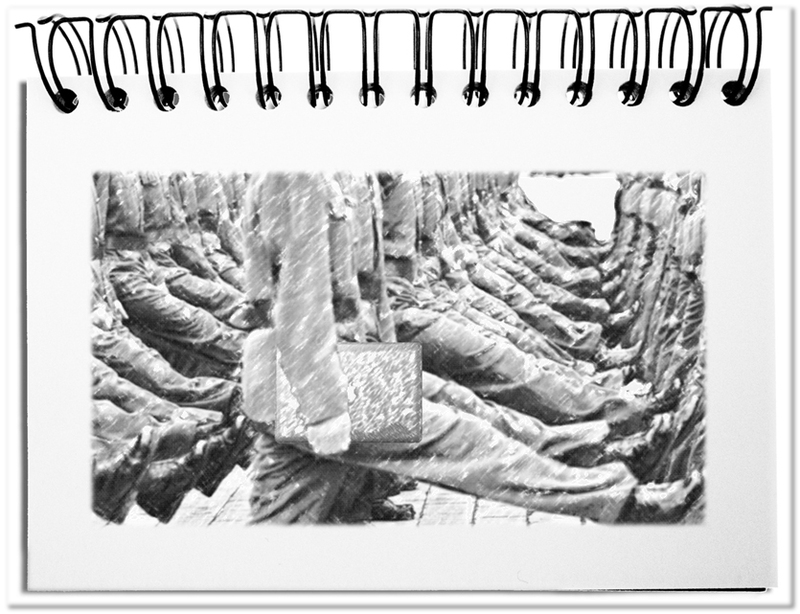 Bottom line: Today’s entrepreneurs resemble a company of soldiers, who drill in the yard. No one quits the generally accepted way and give something new a chance. They forget thereby that this adaptive behavior would not be possible without the spirit of innovation of the previous founding fathers and pioneers, who made the current enterprises. In the established enterprises wild ducks, who would be able to create something new, have only little elbow space in order to make an impact. For making sure that nobody recognizes it, the leaders hide behind the core business, the swarm approaches and generally accepted solutions. This is entrepreneurship in lockstep. Dieser Beitrag wurde am Dezember 3, 2016 von memecon in English, Strategy veröffentlicht. Schlagworte: Best-practice, Core business, Entrepreneurship, Standard software, Swarm approach.